On January 11, 2019, we showcased our sneak peek of two siege map designs coming to Ashes of Creation Apocalypse soon - Castle Korgan previously owned by the Aelan humans and Castle Milnar constructed by the great Dünzenkell dwarves. These great castles of Verra were the cornerstone of defense for the Empires that owned them. Once home to legendary battles that turned the tides of power and influence on Verra. Now abandoned by the great powers that have fled Verra through the Divine Gateways, these great pillars of civilization are battlefields in the Apocalypse. Before we get into the overview, we do want to mention that we are still in our development phase of our games, so all design decisions are still subject to change, but this is our current design plan for the Castle Siege mode. Each Castle Siege will take place on a map that is one kilometer by one kilometer in size. This mode will have a set match duration that can be modified by Control Points captured during the match. We are aiming for these matches to take anywhere from thirty to thirty-five minutes. After selecting the Castle Siege Mode in the lobby, you’ll be able to select your preferred role of Attacker or Defender. The matchmaker will try to place you in your selected role, but in order to ensure you do not sit in queue too long, it may not place you in your selected role so that you can enjoy the game faster. Once you’re in the match, your role will not change. The Attacking Team’s victory condition is to take the Defending Team’s Relic which is the final Control Point in the castle. They will also have several Control Points located in their camp to encourage Defenders to skirmish outside the castle walls. These will also act as spawn locations for the Attacking Team. 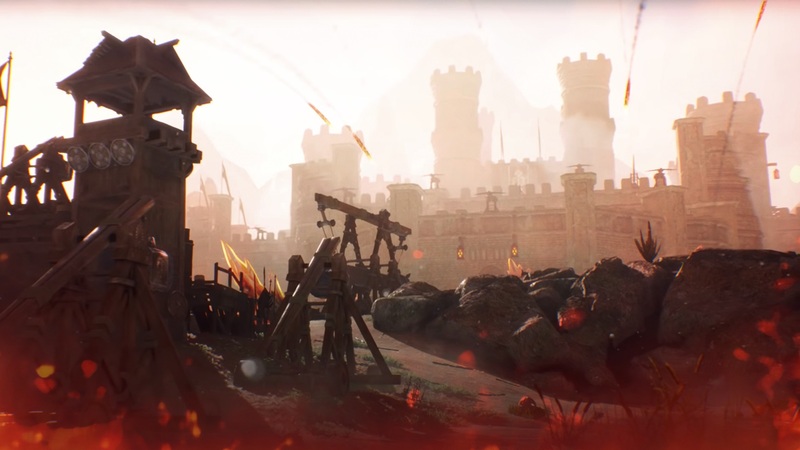 There will be a variety of siege weapons available to the Attacking side including Trebuchets and Battering Rams. Trebuchets’ range will be long enough to reach the enemy ballistas from their initial placement points. These placement points will be out of player character’s weapon range from the castle walls, but within ballista range, and scattered on the battlefield. If a Defender captures an Attacker’s Control Point, the total match time decreases, the Attacker Teams’ respawn time increases, and it also provides a temporary morale buff to the entire Defender’s side. Defenders will also be able to teleport to any Control Points that have been taken. The Defending Team’s goal is to run out the clock while preventing the Attacking Team from capturing their Relic. They will spawn in and around their Reliquary room. These will be Control Points that are owned by them at the start of the match. There will be a variety of siege weapons available to them including Ballistas and Traps. Ballistas will have fixed positions on castle towers. Traps will be placeable items that the Defending Team can use to damage and crowd control their enemies. Note that these items are destructible by the Attacking Team. An Attacker who captures a Defensive Control Point will increase the total match time, increase the Defending Teams’ respawn timers, and provide a morale buff to the entire Attacking team upon capturing a Control Point. In order to capture a Control Point, players will interact with the Control Point to Channel the capture. Only one player needs to do this, and the amount of channel time required to capture will increase with the value of the Control Point. For example, if the Control Point is closer to the Relic for the Attacking Team, it would take longer. Channeling is interruptible only by death, but the progression of the Channel Time is saved. The total channel time will be split into “checkpoints.” For example, if you Channel for 43 seconds of a total required 90 seconds and die, perhaps 30 seconds of the Channel progression is saved for X amount of time. After queueing for the Castle Siege Mode, and upon entering the match, you will be brought to a Siege Class selection page where you will be able to see how many of each class has been selected for your side before you make your choice in real time. You will be able to lock in your choice and ready up, or you will be assigned to one of the least selected classes if the timer runs out before you have made your choice. We will not be limiting class selections, so if you want everyone to be an Engineer, go for it, but we do want to note that team composition will make a big difference, and is very important to the strategy of winning! We’ll have another post that will go in depth about all of the Siege Classes, but each class will have its own health and armor values, and comes with two weapons - a primary and a secondary, and 5 class skills. Armor and Mana are supported by Engineers, while health and stamina will be restored via the High Priest. The main damage classes will be the Archwizard and Hawkeye while the Warrior Classes - Guardian and Weapon Master - will take on the tank roles. Each weapon will be assigned a skill to the character when it is active. You’ll be able to tell what class someone is and what weapon they have equipped by the class emblem above their head. You’ll have infinite lives, and upon death, you'll join a shared team respawn timer where you will respawn with everyone else who has died. We are still testing whether or not we’ll allow you to swap classes in the middle of the match, but for now, we will not be allowing this. What will be different in the MMORPG? The Castle Siege mode is another example of a playable slice of the MMORPG that Apocalypse is providing early testing for. While it’s a somewhat smaller scale experience than the one you’ll have in the MMO, the overall flow of taking and defending a castle will remain similar. There’s some additional systems you’ll see in the final product, like the influence of Nodes over the available defensive emplacements, the crafting and deploying of custom siege weapons, and the summoning of siege monsters. These are all things that we’ll be adding on top of this mode upon our release of Ashes of Creation. We can’t wait to have you help test our Castle Siege Mode! We’ll have more details and gameplay videos to showcase the mode, and classes, so stay tuned! You can register for the game here, and we’ll keep you notified when our next testing phase is, so follow us on Twitter and Facebook!